W. Flood 1904 - 1946 Red School Hull P.Q. Notice his use of ovals in this centralist composition. The red school sits like a large diamond, (in this case ruby), on a ring. Notice also how the school shape reflects the painting shape as it sits centrally forming a stable timeless foil against which the transience of childhood is played out in what could be referred to metaphorically as the ring of life. 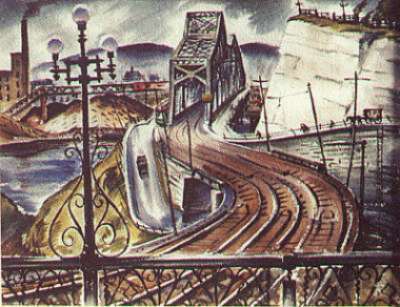 Note the strong "S" shape from the foreground up through the bridge - the light standard on the left foreground is almost animated into an onlooker, it's verticality pulling against the reddish curve of the tracks. 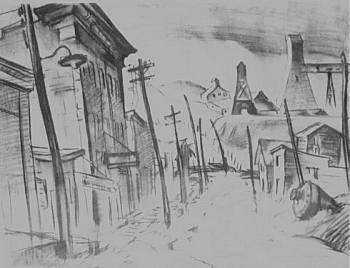 The stresses in the composition are held in place by a veritcal / horizontal grid formed by the intersecting lamppost and railing in the foreground. It is fascinating to compare the photo to the painting to see how the artist poeticized a common scene. It is interesting to note the common characteristics in these two compositions. 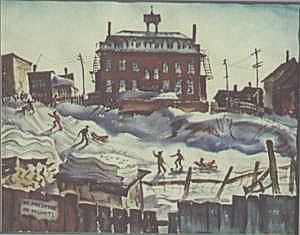 The red school house and the bridge both occupy a similar position in the pictorial field. The wood fence in the foreground of the red school house and the iron fence in the foreground of alexandra bridge both occupy the lower portion of the foreground. Look at the redish shape in the lower left foreground of the red school and compare it the the shape of the fence in the lower left foreground of the alexandra bridge. They are similar. The middle ground of both compositions make use of curves. We could continue our analysis but I have made the point that there was a common underlying structure to both compositions even though they both appear different. This is a good example of that old saying, "hide the art". 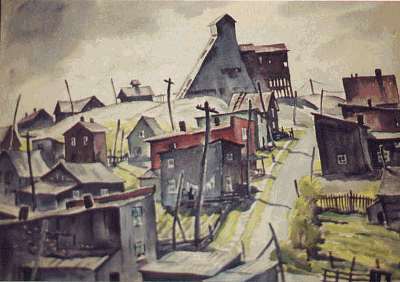 "great sheets of silver are torn from the veins of the earth - such was the birth place of Cobalt in Northern Ontario - a mud drenched company mining town. Mr Flood dips into his basket of metaphors and uses the passing storm motif, forcing us to follow him upward through colour and character to rises above the blood, sweat and toil drenched shanty-town below. We have two paintings each done from the same source sketch and . each one different in character. This is a very interesting find for students of art. Hogs Back has always been a popular picnic area On warm spring and summer days hundreds of people gather to sit on the rocks dangleing their feet into the cool rushing water. This watercolour just radiates sunlight hitting the rocks and bouncing off winters ice. It takes incredable skill to obtain this effect. Mr. 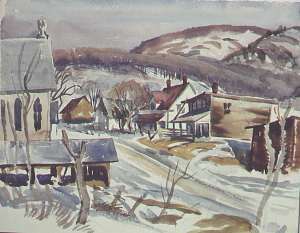 Flood has once again created a brilliant watercolour in a masters medium. 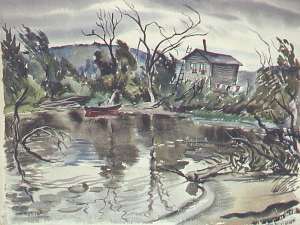 W. Flood 1904 - 1946 "La Salette, P.Q"
This water-colour compared to the "Sunlite Rocks" water-colour is more spontaneous in it's treatment - having a quick on site sketch quality. The quick fluid washes and certainty of the brush strokes reinforces the plein-air feeling and gives us an insight into this painters keen eye and quick mind. I would interpret this to be a site sketch. Another very rapidly executed water-colour showing absolute mastery of water-colour effects. You can feel a chill in the wind and the wetness of the water - all achieved with out resorting to photo realism which appeals to the eye and not to the soul . Mr. Flood has given us another great water-colour. This water-colour retains much of the spontinaity shown in the site sketch below. 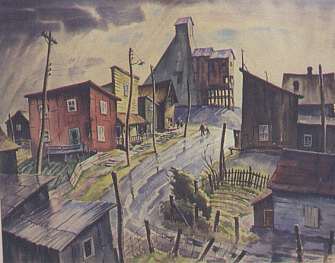 The small street light hanging from the second-post-in marks the center of the composition. This was a tendency on the part of some artists of the period. Notice how the dark shed on the right side counterbalances the mass on the left. In the site sketch below he gave more prominence to the towers on the right and less to the shed and less to the mass on the left. 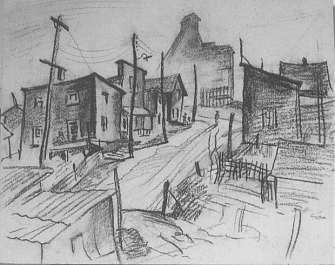 The subject matter and it's rendering is reflective of his period and the Group of Seven members he sketched with. 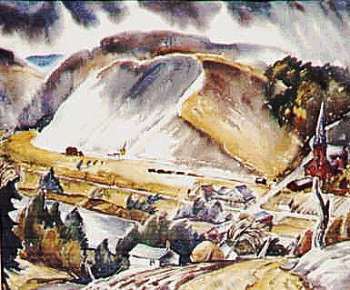 A water-colour showing absolute mastery of effects. 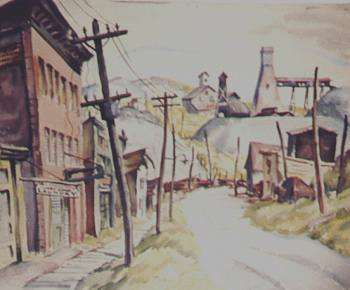 W. Flood 1904 - 1946 "Bells Corners"
There is something about this water-colour that calls to mind a child-hood memory of a warm summer afternoon - when the sun suddenly goes behind a cloud and a slight cooling fills the air. Mr. 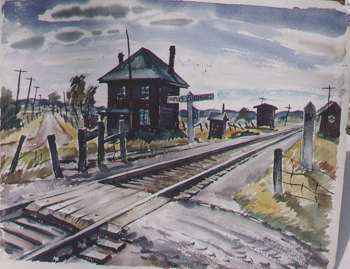 Flood once more touches my soul with his water-colour mastery. 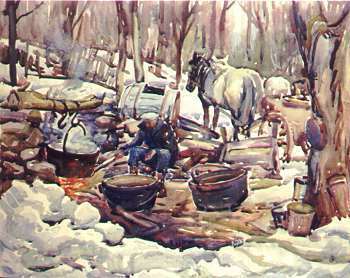 W. Flood 1904 - 1946 "Boiling the Sap, Sugar Bush"
Woven into the composition of this painting is Wilfrid Flood's friend and fellow artist Frank Hennessey - stoking the fire - was to meet an untimely death a few months after this painting was completed. Although Mr. 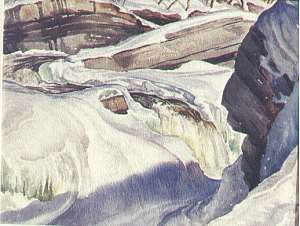 Flood has followed the traditional method of composition; foreground, middle ground; background, the left side of the snow bank in the foreground has a vertical stopping tendency which twists into more horizontal diagonal features on the right foreground - providing the eye with a path to enter the scene and forming the boundary of a circular motif. An excellent water-colour, this type of draughtsmanship is no longer available on the market. 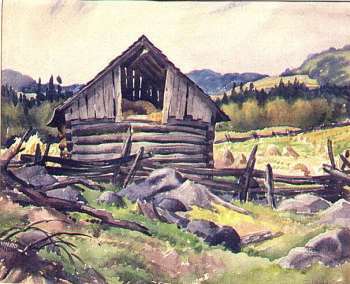 His rendering of the boards and logs hint at his art training in England. The graphic has been slightly enhanced to catch the freshness of the scene for electronic presentation. it would be interesting to see the site sketches. 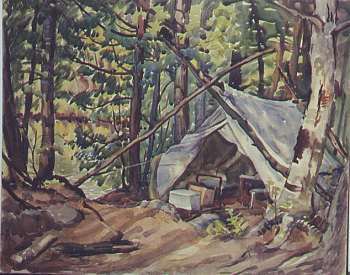 W. Flood 1904 - 1946 "Gatineau Camping"
Summer of 1940 - the war years. Mr Flood has caught the outdoor atmosphere of camping in the bush. The tent not only symbolizes our relationship to nature but also our dependence upon a complex infrastructure to maintain life. The tenor of the paiting, in relation to the historical period in which it was painted, reinforces the artists tendency to live in a world within a world. 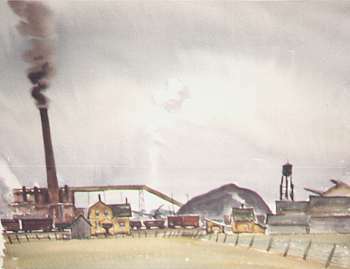 W. Flood 1904 - 1946 "Paper Mill Thurso"
We are by now aware that Mr. Flood is an experienced painter. In this painting there is something about the quality and colour of the smoke rising from the stack that touches me deeply.